This week I’m sharing two posts that are one part travelogue, and one part how-to, all with the goal of inspiring you to find some wild and adventure in your own backyard. One weekend in November I challenged myself to do just that. I’d spent a lot of time wishing I could get out into nature more, but feeling like there weren’t a lot of cool places to do so around my hometown of Tulsa, OK. So I decided to spend more time doing than lamenting for once and headed for the Ozarks of Arkansas. Earlier this week, I shared my rock climbing experience at the Horseshoe Canyon Ranch. The adventure didn’t stop there, though. 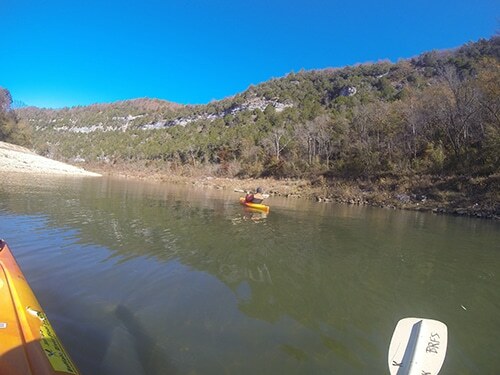 The next morning we kayaked a portion of the Buffalo National River. 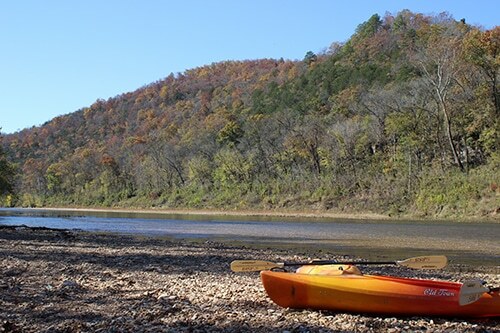 Established in 1972, the Buffalo National River winds its way through the Ozark Mountains for 132 miles. 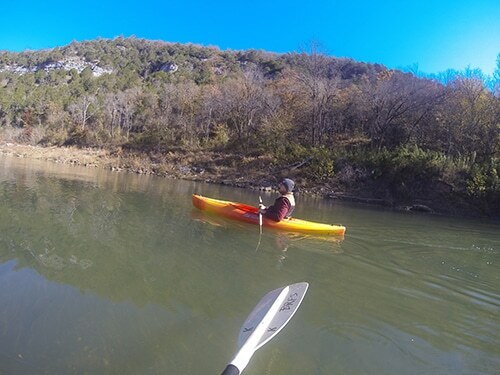 Darren Bush, our resident canoe and kayak expert, lists the river as one of the top four wilderness canoe destinations in the United States. Yet despite living just three hours away from this noteworthy destination for almost 30 years, I had never been. Twas time to find the wild in my own backyard! Several canoe and kayak outfitters sit along the river — each permitted by the National Park Service to service a certain section. 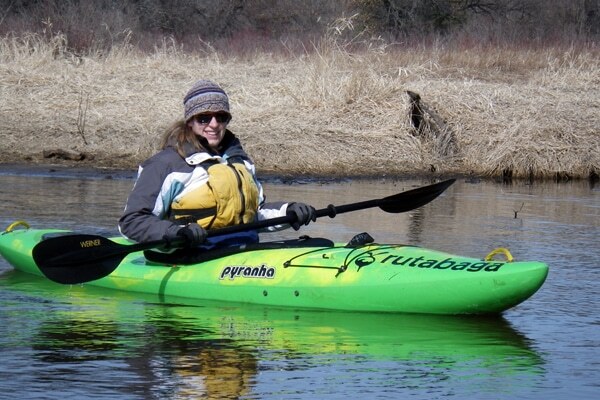 So picking an outfitter is a matter of picking which part of the river you want to paddle. However, some of them aren’t open in November, as parts of the Buffalo are too shallow for boats during the fall season. There was an outfitter near the Horseshoe Canyon Ranch where we did our rock climbing, but they were among the closed, their peak season being March through June. Luckily it had rained in the area in the days leading up to our trip, and the Buffalo River Float Service near Yellville, AR, located about an hour away from the H.C.R., was open for business. They charge $40 per kayak, but you get it for the entire day. $40 seems to be the going-rate among all Buffalo outfitters. When Kate and I arrived at the shop, we had to decide how long of a trip we wanted to take. We had three options: a short, medium, and a long trip. Because Kate and I needed to drive back to Tulsa and pick up the kids from my in-laws in the afternoon, we decided to go with the medium-length trip, which we were told would take about 2 hours to navigate. It actually took us less time, but more on that later. After we picked our trip and paid, our next choice was which kind of kayak we wanted to use. While my choices were limited, I had no clue which to choose of the ones the outfitter offered. 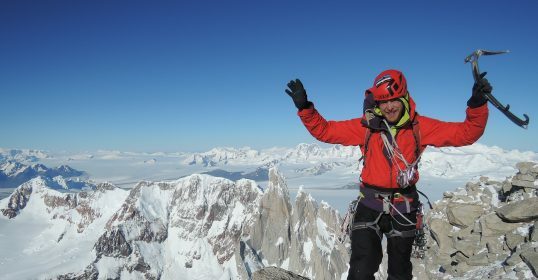 With both of the activities I picked for the weekend, I wanted to both enjoy myself and learn something new about the sport that could help me do it more often in the future. With rock climbing, I picked up some basics on knots and footwork. With kayaking, I decided I wanted to be better informed for my next excursion about the differences between boats. So I asked my old buddy Darren to fill me in on how to choose a kayak. Darren, if you didn’t know, owns the largest single-door canoe and kayak shop in Madison, Wisconsin. (If you haven’t read his “So You Want My Job” interview yet, you really should.) This guy knows his stuff. Canoeing and kayaking is one of the best, most enjoyable ways to get into the wild on a regular basis. So for those readers who have been thinking about getting a kayak so they can paddle off on an adventure whenever Mother Nature moves them, I asked Darren to write up a detailed guide. Take it away, Darren. The kayak has a long and fascinating history (well, to me anyway). Originating in the Arctic, the qajaq was created to allow mobility and the ability to hunt more effectively. In areas where the available materials were limited to sealskin, driftwood, and caribou sinew, you have to hand it to the native people. The original native kayaks were low, fast, and seaworthy, and allowed a hunter to extend his ability to take game. Rather than sitting by an air hole waiting for a seal, the hunter-paddler could go after seals, swimming caribou, and even walruses and narwhals. That’s a lot of protein. In the 1940s, a Smithsonian Curator named Howard Chapelle did an anthropological survey of the kayaks of the Arctic, and found almost 100 different types, each designed for the particular types of conditions found in their areas, the different game they hunted, how much cargo they needed to carry, etc. In other words, these qaannat (plural of qajaq) were tools. Tools that worked properly meant the family ate. If the tools failed, starvation followed. Kayaks share a lot of the same anatomical parts as other watercraft: a bow (front) and a stern (back), a deck (the top), and a hull (bottom). A kayak has a cockpit, where the paddler sits. Deck lines and bungee cords often grace the deck of a kayak, for handling the boat and storing a water bottle or an extra dry bag with a sandwich in it. Longer boats have a mechanism to control the direction of a boat. A rudder sits at the back like a sailboat’s rudder, but is controlled by foot braces as the paddler’s hands are quite busy with the paddle. Other craft have drop-down skegs, a fin that protrudes and adds some ability to correct the effect of wind and waves on a kayak. Sea kayaks, or touring kayaks, are long, fast, and seaworthy. They are the natural heirs to the original kayaks. Indeed, I own a kayak that has lines similar to a kayak originating in the Greenlandic village of Igdlorssuit. Cool, eh? A sea kayak runs from 16 to 19 feet long, with most of the models clustering around 17 feet, and are usually 22 to 24 inches wide. They are capacious: my expedition kayak holds three times more than an expedition backpack. This allows you to carry fresh water in conditions where salt water is ample but fresh is not. A sea kayak contains hatches and bulkheads. The hatches allow access to the interior of the kayak behind the seat and in front of your toes, where bulkheads keep the water in the cockpit in the event of a capsize. 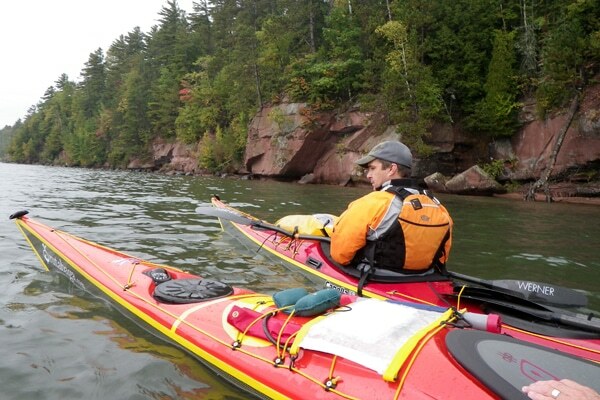 Sea kayaks can take you to beautiful places like the Apostle Islands National Lakeshore on Lake Superior. Generally these kayaks have very little rocker. Rocker is best defined as curvature of the hull along the keel line. Think of the base of a rocking chair: the two pieces of wood are called rockers for a reason. Rocker is what keeps the bow and stern (front and rear) of the kayak lifted a bit out of the water, which allows a longer boat to turn more easily. Who wants a sea kayak? Not just adventurers and explorers. A lot of folks purchase sea kayaks and rarely open the hatches. They just like a high-performance, efficient hull, suitable for exercise or just getting out on the water. If you’re a backpacker and want to save your knees, I sometimes call sea kayaking aquatic backpacking. If a sea kayak were a car, it would be a big, comfortable touring car with some speed and capacity. If you wanted to drive across the country, you’d want to be in a Cadillac or an old Pontiac GTO. Some of the smaller sea kayaks might be a Mustang or a BMW 5 series. Either way, think comfort on the long open stretches of Route 66. From the sea kayak with its speed and capacity, we go to the other end of the spectrum: whitewater kayaks. Whitewater kayaks are half the length of a sea kayak, and a little wider, but the big difference is the rocker. While a sea kayak has almost no rocker, a whitewater kayak has massive rocker. The ends of the kayak are completely clear of the water except when punching through waves or plunging over a drop. This means the ultimate in maneuverability. What you gain in maneuverability you lose in efficiency, but that’s fine. Your river is providing the power. You’re working with your boat to harness the power of the river and using it to help your boat go where you want it to. That doesn’t mean you don’t have to work; the river provides the power, but you provide the power steering. Whitewater boats generally have a lot of buoyancy. You want that volume to pop your boat back to the top of the water, not stay submerged. The “bigger” the water you paddle, the more volume you want. Paddlers running waterfalls over 100 feet tall want to surface quickly. Like sea kayaks, there is a range in size and maneuverability. Shorter boats are super maneuverable, longer boats track a little better and allow a beginner to get used to the feel of a sportier kayak. 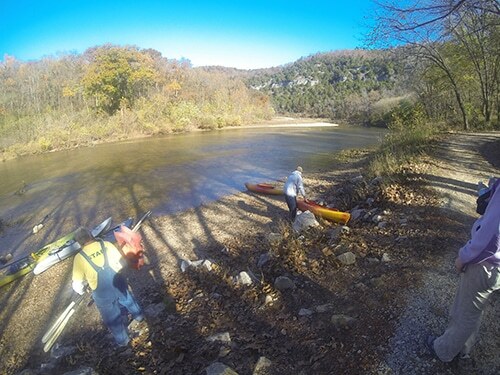 Some of the newer models (crossover kayaks) have drop skegs to help them track better when you get to the bottom of a rapid and need to paddle some flat water before the next drop. If a whitewater boat were a car, it’d be an off-road vehicle suitable for taking on the Baja 500 race. It’s not going to be efficient, drive straight easily, or allow you to be cavalier about handling it. It’s going to be beefy, gnarly, and able to take whatever is thrown at it…provided the driver knows what he’s doing. 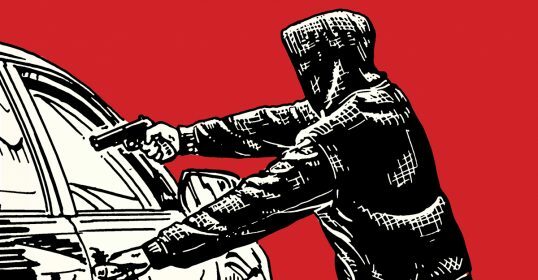 Say you don’t need that Cadillac or GTO for the Cannonball Run, but you still want to take day trips up and down the coast. There’s a kayak for you. 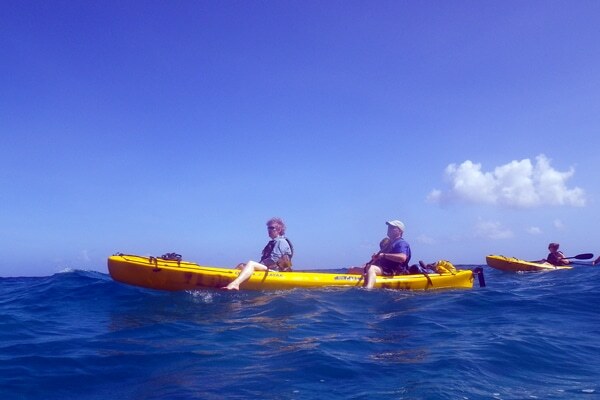 Day Touring or Light Touring boats look like sea kayaks but are shorter and wider. Day Touring kayaks are basically a smaller, more stable cousin of the true sea kayak. They’re shorter, usually 13 to 14 feet long, and are wider and more stable. They’re not as efficient as a sea kayak and have less capacity (of course), but to the untrained eye they look very much like a sea kayak, just a little shorter and pudgier. Can a day touring kayak do a longer trip? Sure, just pack like a backpacker and be willing to paddle a little longer, as Day Tourers have a lower potential hull speed. If a Day Touring kayak were a car, it would be a Corolla or Malibu, or other similar 4-door sedan or small wagon. You could easily drive one across the country, and people do, but a larger car might be more comfortable. The analogy isn’t perfect, but it’s pretty close. Take a Day Tourer and remove most of the storage, shorten the boat a few feet, enlarge the cockpit, and add a few inches of width. That’s what we call a recreational kayak. That’s because they’re strictly for recreation. Averaging 10 to 12 feet, a recreational kayak is the most stable craft you’ll find. They’re not made to go anywhere fast, but they are comfortable and beginner-friendly. You’ll find these kayaks to be a great value if you just want to get on the water, period. What do you give up? Speed, usually. The shorter the boat, the less time the water has to move out of the way and then fill in behind the kayak as it passes. Try to move too fast and you’ll have a big bow wave as the water tries to get out of the way and a big hole behind the kayak as the water tries to fill in. Take your time, and they’re efficient in terms of how much energy you have to exert. You just can’t be in a hurry. If a rec kayak were a car, it would be a nice, comfortable but underpowered subcompact. Nothing to write home about in terms of performance, but they get you out there. They sip fuel and are efficient, but lord help you if you try to peg the speedometer. Then there’s the odd ball kayak that sort of isn’t. SOTs are as different from the traditional kayak as can be and still be called a kayak. You don’t sit inside these kayaks, but rather on top of the deck, which is slightly depressed to create an open cockpit. A tandem (double sit-on-top), Na Pali Coast, Kauai. Our toes were hot. SOTs became very popular in the late 80s. Resorts and recreational areas wanted to offer their customers a kayaking experience without the bother of rescuing them when they turned over. 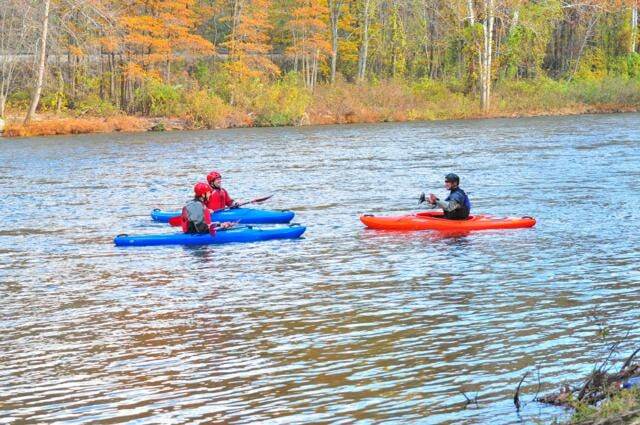 Self-bailing SOTs are awesome for ease of use at the cabin or other places where beginners will be paddling without supervision. They are super stable. Lately these craft have become platforms for anglers. Kayak fishing is one of the fastest growing segments of kayaking, as a kayak allows an angler to approach fish in extremely shallow water; places a power boat can’t go. Kayaking fishing tournaments are popping up all over the country. If SOTs are so awesome, why doesn’t everyone paddle them? They’re not very efficient. They aren’t boats that most people use for paddling for the sake of paddling, but they’re really good platforms for many other uses besides fishing. If you want to take your 80-pound black lab in a kayak, a longer SOT might be perfect. If an SOT were a car…hmmm…that’s a tough one. Maybe an old International Harvester Scout with the original 4-cylinder engine. It’s not going to get you anywhere fast, but it’s a great tool for hauling a few bales of hay and doing double duty taking you to your favorite fishing spot with a boat strapped on top. So those are the basic categories. Each of them can be made of different materials. There are many, but I’m going to cover the most common three types. Composites. These boats are created in a female mold, building from the outside in. First a layer of resin, colored or otherwise, then layers of fiberglass, Kevlar, Spectra, polyesters, and carbon fiber cloth are added with resins to bind them together. Sometimes these boats are built with resin infused under a vacuum to control saturation. Pretty cool. The benefit of a composite boat is that it can be built so strength is exactly where it needs to be. 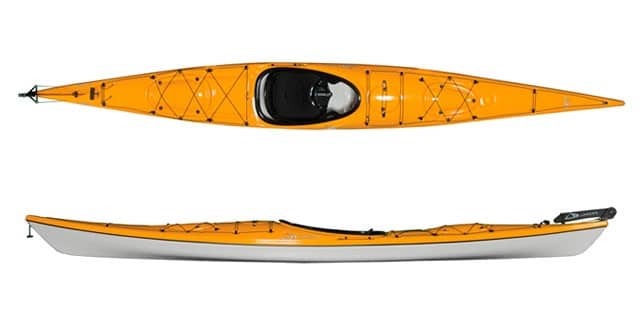 This ability to selectively reinforce areas of a kayak can make it strong and light. It also can be repaired relatively easy, and is in my mind the most aesthetic of materials. Polycarbonates. These boats are made from polycarbonate plastic sheets, which are heated under large heaters and pulled over a recessed mold and vacuum-formed into place. Built in two pieces, the deck and hull are then joined together with a methylacrylate glue (think super glue on steroids) and become chemically bonded. Oohh…shiny. Polycarbonate boats look like composite boats. Polycarbonate kayaks are light, though not as light as composites. They’re shiny and look a lot like composites to the untrained eye. They cost less than a composite kayak and have a lot of value for the money. Polyethylene. This is the most common material used for kayaks as it is durable, and relative to the other two materials, inexpensive. It is heavier, as that is the nature of the material. It comes in specially formulated mixtures, held secret by the manufacturers. 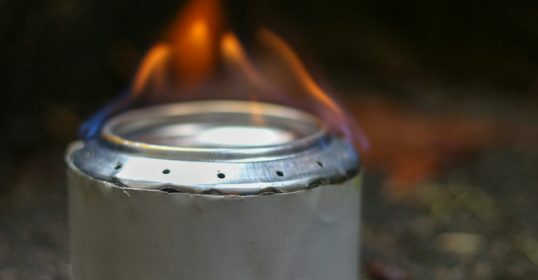 The polyethylene is introduced into a hollow metal mold, and the mold is heated in an oven while being rotated to coat the inside of the mold. After half an hour or so, the clamshell mold is split and a soft, taffy-like kayak is pulled, strapped into a form and allowed to cool and firm up. As the molecules of the polyethylene rebond, the material gains stiffness and toughness. 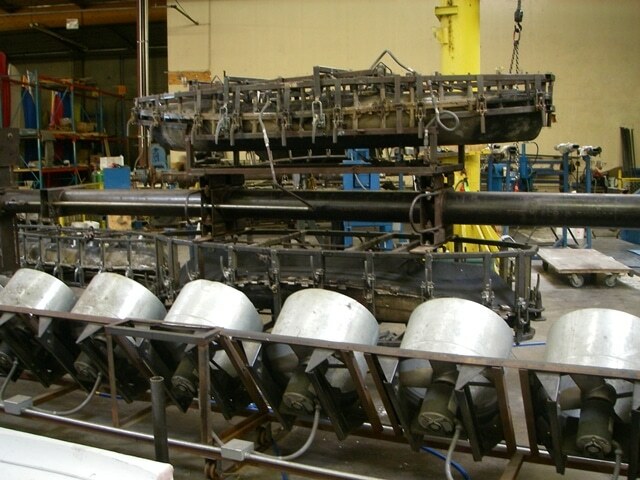 A rotational mold (top) is cooled by a bank of fans before pulling the hull out. Downsides? They are heavier, and more difficult to repair if you should put a hole in your boat. My experience is that only the most persistent dope can put a hole on a polyethylene kayak, usually while dragging it across the parking lot (painful to watch). Polyethylene also flexes more, which, while adding durability, decreases efficiency. A poly boat is awesome for boats that will spend a lot of time banging off rocks. Okay, now what do I get? My rule of thumb is to purchase the kayak that best matches your use 80%-90% of the time. The reason I say this is that a lot of folks buy what I call aspirational kayaks for the big trip they might do someday. That is like purchasing a panel truck to drive every day because someday you’re going to move. Think about that. What are you going to do? That’s your decision, and best decided by trying out different areas with different boats. Rentals are a good way to start, but bear in mind their condition. Take a good look at the state of the equipment, and if it’s not in good repair, you won’t have a good experience. At minimum, test paddle anything you buy. You wouldn’t plunk down hard-earned cash for a car without a test drive, right? Reputable shops have test paddling either on site or have demo days periodically. What’s the most important feature of a kayak? You’ll be surprised. It’s not the hull. Without a good, comfortable and supportive seat, the best hull in the world won’t matter because you won’t be long enough it for the hull to matter. You should be able to spend a good deal of time in the seat without your legs going to sleep or your back getting sore. Make sure it’s adjusted properly, of course. Seats can be modified to make them more or less supportive depending on your wants, but a good seat well-adjusted should be a prime consideration. This doesn’t mean that the design doesn’t matter; it does. You should be able to find a boat that does both. Some of my more high-end sea kayaks needed a lot of work to get the boat to fit properly, but that’s because in that sort of boat, fit is critical to performance. However, in most recreational and day touring models, the seat should be excellent. Talk to people. Real ones. Online reviews are a mixed blessing. On one hand, they’re information from the democratic masses, unbiased by the taint of commercialism. On the other hand, reviewers have little experience with anything outside their particular kayak. Asking a person if they like their kayak is a bit like asking a parent to rate the attractiveness of their child. Try to find people who paddle where you want to paddle. Ask them their preferences, noting their experience level, body size, and type, etc. Ask a lot of questions. A good shop (like mine, he says humbly) has paddlers who use the stuff they sell. We like it when people ask questions. It means they’re curious about something we love. If you’re looking at a used boat and want to see if it’s a good deal and would work for you, be upfront with us and we’ll help you figure it out. That’s what paddlers do for one another. We have helped people find the right boat…somewhere else. Kayaks are as safe as you are. Like many activities, kayaking is not inherently dangerous. It can be, however, unforgiving of a lack of judgement, skills, and attention to surroundings. Leave the beer for the apres-paddle party and wear your lifejacket. The vast majority of fatalities are due to alcohol, lack of a lifejacket, or both. Ultimately, people ask me what’s the best boat. My answer is always the same. The one that gets wet the most. Kate and I had the choice between a sit on top kayak or a recreational kayak that you sat inside. We went with the latter. The outfitter had us drive our car to the take-out point of the trip. He then picked us up in his pick-up truck that hauled our kayaks and drove us to our starting point. We got a crash course on how to paddle and steer a canoe and were then sent off. The upper parts of the river have class II whitewater. We were floating a lower section of the river, so the water was pretty placid. Great for beginners like ourselves. What the river lacked in excitement, it made up for with solitude and fantastic scenery. For most the trip, we were surrounded by high bluffs covered in beautiful fall foliage. On several parts of the trip, we’d stop paddling and just let the current take us while we took in the view. We didn’t see another human being the whole time. Super relaxing and refreshing. As I mentioned above, we took the medium-length trip thinking it would take us a more than two hours to navigate. Because Kate and I paddled most of the trip, total float time ended up being like an hour and 20 minutes. We were totally bummed and surprised when we reached out take-out point. Our time on the river was definitely too short. If I do it again, I’ll take the longer trip. When we arrived at the take out point, we just had to pull out our kayaks and leave them on the sandbar. The outfitters would come by at the end of the day to pick them up. With that, our weekend in the wild was over. I had great time on the whirlwind trip; I never thought I’d find a place that rivaled my Green Mountains of Vermont, but the Ozarks come in at a close second. And they’re only three hours away from my house! What boggles my mind is how underrated this part of the country is. It has a beautiful topography, a diverse ecosystem, super friendly folks, and plenty of areas for outdoor enthusiasts to find adventure. Kate and I can’t wait to go back with our kiddos to explore all the trails, caves, and streams the Ozarks have to offer. We’re definitely going back to the Horseshoe Canyon Ranch next year for some more rock climbing. I can see it becoming a regular McKay family vacation destination. As to my original question of whether a weekend trip is really enough time to feel worthwhile? The answer is a resounding yes. The trip seemed surprisingly long, and I truly felt like I got away from it all and was far, far away from suburban Tulsa. The hassle of planning was more than offset by how refreshed and rejuvenated I felt after our trip. Despite going on the excursion when our busiest time of the year for the blog was getting in gear, we both felt calm and relaxed. I’d even venture to say that getting that “nature bath” in has helped keep our sanity throughout December. 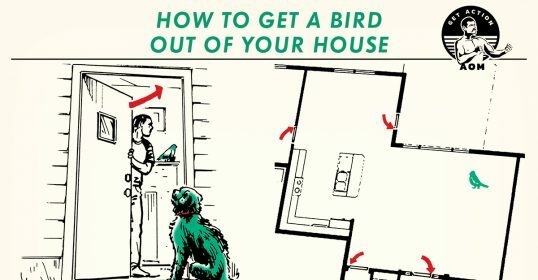 If you’re like I was, and pining to get out into the wild, but feel your options are limited due to where you live, give your area a second look. I think you’ll be pleasantly surprised by the outdoor adventure you can find in your own backyard. Don’t let waiting for the “perfect” destination keep you from getting in touch with your wild.